Phyllis Thomas was born at a place called Riyarr on the Turner River, south east of Purnululu. When young she worked on Turner Station looking after poultry, gardening, grinding salt and carting water from the well. However she often preferred to run away into the bush with the old women to hunt, collect dingo scalps and look for gold. Phyllis was a Gija woman of Nagarra skin whose bush name, Booljoonngali, means ‘big rain coming down with lots of wind’. She began painting when Freddie Timms set up the Jirrawun Aboriginal Arts group in 1998. 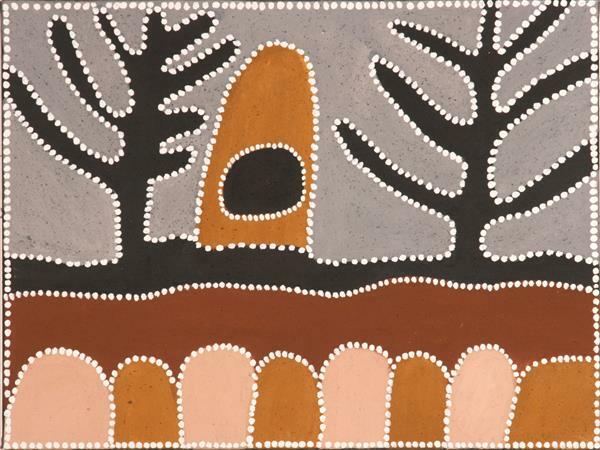 Her work achieved almost immediate success, depicting Ngarranggarni (Dreaming) places and bush tucker from Roogoon (Crocodile Hole) area as well as the country around the middle reaches of the Ord and Turner Rivers where she was born. 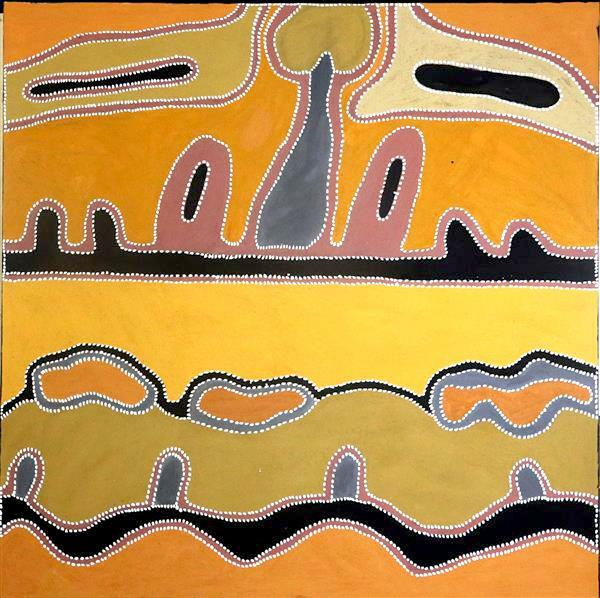 Phyllis was represented in the National Aboriginal and Torres Strait Islander Art Awards (NATSIAA) in 1999 with a stunning picture of Boornbem Goorlem, Hot Water Spring II. Her work has been acquired by a number of collectors and galleries including a special focus purchase of five paintings by the Art Gallery of Western Australia (AGWA) in 2000. Her painting The Escape was highly commended in the seventeenth NATSIAA in 2000, and was purchased as part of the Museum and Art Gallery of Northern Territory’s Telstra Collection. An eight-panel series on the same subject was shown at Raft Artspace in Darwin in 2002, and was purchased by AGWA in 2003. Phyllis’ work titled My Stolen Sisters from Gija Country, recounting the journey of her family members during the stolen generation in the east Kimberley, was a finalist in the Art Gallery of NSW’s 2018 Wynne Prize. Phyllis was also a singer and dancer with the Neminuwarlin Performance Group in its production of Fire, Fire Burning Bright, which premiered at the Perth International Arts Festival in February 2002 and opened the Melbourne International Arts Festival at the State Theatre of Victoria in October 2002. Phyllis sings the haunting Warnalirri with Peggy Patrick on the second half of the group’s CD. Phyllis also worked on Joonba, Junba, Juju, a collaborative project with Kimberley Aboriginal Artists (KAA) that focused on sharing song and dance cycles across Indigenous language groups in the Kimberley. She also spent time on cultural projects such as youth media collaborations, and was a key teacher in the language program for young adults in Warmun.